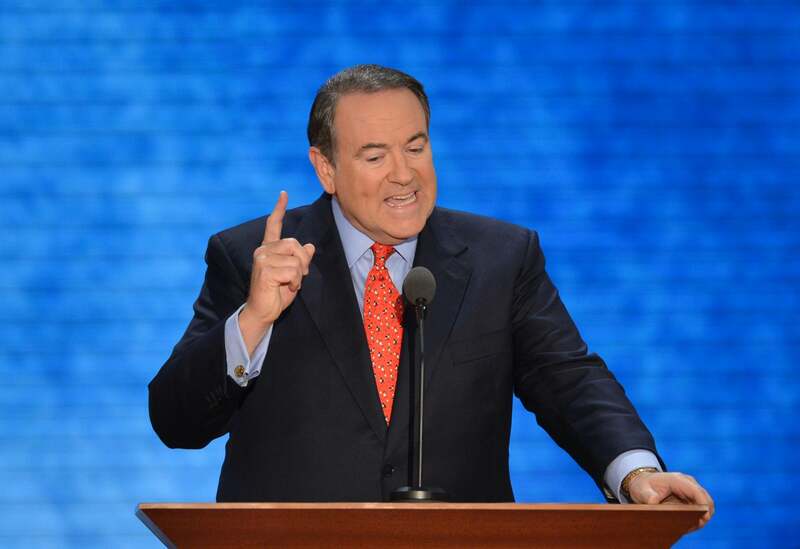 Mike Huckabee, libido: He pretends the media is lying about his quote. It depends on what your definition of “libido” is. The politician caught up short by a gaffe can respond in all sorts of ways. He can 1) apologize—those were not the words he was looking for! He can 2) insist that biased hacks and/or flacks were distorting what he said. He can 3) own the gaffe, and reword it, to make up a policy on the fly. Mike Huckabee, who—credit due—understands the media better than he understands feminism, has responded to the fooferah over his “libido” comments by merging strategies one and two. On the Saturday episode of his Fox News show, Huckabee spent more than five minutes walking through the controversy, crediting his audience for being “smarter than the media.” You see, he was only repeating what he said on the most recent episode of his show (true). Conservatives had agreed with him. Why did a rougher version of the same remarks generate a controversy? He’s narrowly right about that. MSNBC’s Kasie Hunt originally wrote: “Huckabee: Women ‘helpless without Uncle Sugar coming in and providing them … birth control because they cannot control their libido.” That left out the point of the whole riff, that Huckabee was accusing Democrats of considering women helpless. Problem is, the rest of the media got the quotes right from the start, and CNN/MSNBC quickly corrected the tweets. For Huckabee to be a victim here, the rest of the media would have had to rely on the botched quotes. Didn’t happen. * In a surreal moment, Huckabee told his audience that “even White House Press Secretary Jay Carney was reacting to a completely phony story.” He played this question, from Thursday’s White House briefing. I’ve bolded the key part. Jay, not that long ago, at the RNC winter meeting here in Washington, Mike Huckabee said that the Democrats’ message to women is that they are – I’m reading from the report here – “they are helpless without Uncle Sugar coming in and providing for them a prescription each month for birth control because they cannot control their libido or their reproductive system without the help of government.” Is that the president’s message? What the heck was Huckabee listening to? The reporter clearly got the quote right—“Mike Huckabee said that the Democrats’ message to women” was yadda yadda libido Uncle Sugar. Huckabee pretended that the reporter got it wrong, and his audience applauded. The next day, as this Twitter thread started by Matt Lewis demonstrates, conservatives were piling on reporters for refusing to admit that “the narrative” was false. It’s a fascinating exercise in ref-working, an attempt to define Huckabee’s gaffe as a media gaffe. Sorry, it just isn’t. Two reporters got a quote wrong. Everyone else got it right, and the errant two quickly corrected their record. The White House responded to an accurate version of the quote. Even on his own TV show, Huckabee couldn’t come up with an example of the botched quote driving a story. He played the accurate quote, and insisted it was a botch. The press is being told to apologize because it’s not as easily fooled as Huckabee’s audience. *This National Review “Timeline of Media’s Huckabee Hysteria” accidentally demonstrates what I’m talking about. It records that CNN’s Dana Bash and MSNBC’s Kasie Hunt got the quote wrong—no one denies that—and goes on to play their actual TV reports, which get the quote right. But we’re told the story blew up “in part surely because they were misinterpreted.” No evidence, no other media getting the story wrong—pure assertion. Huckabee’s counting on lots of similar misinterpretations.